• CHL is hospitality sector company from K Raheja Corp group. • Renaissance, JW Marriot, Westin are the brands of CHL. • CHL has posted bumper profit for FY17 with one time other income. • Issue is having negative P/E due to losses posted for first half of FY19. Chalet Hotels Ltd. (CHL) is part of K Raheja Corp group hospitality arm. It is an owner, developer and asset manager of high-end hotels in key metro cities in India. Its hotel platform comprises five operating hotels, including a hotel with a co-located serviced residence, located in the Mumbai Metropolitan Region, Hyderabad and Bengaluru, representing 2,328 keys, as of September 30, 2018. Company's hotels are branded with globally recognized hospitality brands and are in the luxury-upper upscale and upscale hotel segments, according to the Horwath Report. CHL's hotel platform emphasizes strategic locations, efficient design and development, appropriate positioning in hotel segments together with branding and operational tie-ups with leading hospitality companies. The company uses experience to actively manage the hotel assets to drive performance. In addition, it has developed commercial and retail spaces, in close proximity to certain of its hotels. CHL generally develop hotels on large land parcels, allowing it to situate a greater number of rooms, as well as provide a wide range of amenities, such as, fine dining and specialty restaurants, large banquet and outdoor spaces. The company endeavor to build hotels to superior standards targeting the luxury-upper upscale and upscale hotel segments at an efficient gross built up area and development cost per key. Its hotels are currently branded with global brands such as JW Marriott, Westin, Marriott, Marriott Executive Apartments, Renaissance and Four Points by Sheraton which are held by Marriott Hotels India Private Limited and its affiliates (collectively "Marriott"). CHL also determines, by detailed financial and operational analysis, whether hotel operations should be undertaken directly or by engaging third party hotel operators. Currently, company's hotel at Vashi, Navi Mumbai, is operated by it under a license agreement with Marriott, and four of hotels, including serviced residence, are operated pursuant to hotel operation and related agreements with Marriott. To part finance repayment/prepayment of certain debts, working capital needs CHL is coming out with a maiden IPO via book building route to mobilize around Rs. 1641 cr. CHL IPO comprises fresh equity issue worth Rs. 950 cr. (Approx. 33928570 shares ) and offer for sale of 24685000 shares (approx value Rs. 691 cr.) (Based on upper price band). Issue opens for subscription on 29.01.19 and will close on 31.01.19. Minimum application is to be made for 53 shares and in multiples thereon, thereafter. Post allotment, shares will be listed on BSE/NSE. While BRLMs to this issue are J M Financial Ltd., Axis Capital Ltd. and Morgan Stanley India Co. Pvt. Ltd. Karvy Fintech Pvt. Ltd. is the registrar to the issue. Company will pay off debt worth Rs. 720 crore from the proceeds of this issue. Having issued initial equity at par, it raised further equity in the price range of Rs. 20 to Rs. 50 between January 1999 and March 2006. It has also issued bonus shares in the ratio of 3 for 1 on 11.07.1998. Under amalgamation and arrangement schemes it issued 54000000 shares in November 2006 and 18953040 shares in December 2017 as per consideration other than cash. Average cost of acquisition of shares by the promoters is Rs. 0.00, 1.29. 3.17, 6.61, 6.81, 13.00, 26.99, 32.85, 65.57 and Rs. 100 per share. Post issue CHL's current paid up equity capital of Rs. 171.10 cr. will stand enhanced to Rs. 205.03 cr. (approx). On financial performance front, for last four fiscals, CHL has (on a consolidated basis) posted total turnover/net profit (loss) of Rs. 467.06 cr. / Rs. –(126.39) cr. (FY15), Rs. 597.56 cr. / Rs. – (112.49) cr. (FY16), Rs. 924.54 cr. / Rs. 127.44 cr. (FY17) and Rs. 929.51 cr. / Rs.31.16cr. (FY18). For first half of FY19 it has posted loss of Rs. – (43.67) cr. on a turnover of Rs. 497.04 cr. Bumper profits for FY17 is attributed to one time income of sale of certain investments that were included in other income of Rs. 218.66 cr. For last three fiscals it has posted an average EPS of Rs. 2.34 (with bumper profit of FY2017) and an average RoNW of 8.52%. Issue is priced at a P/BV of 10.25 based on its NAV of Rs. 27.32 as on 30.09.18.Since first half of FY19 is showing loss; its P/E cannot be arrived at. However, according to management, such business module is always valued on the basis of EBITDA and CHL has posted on an average around 38% EBITDA margins, which is highest among all players. As per offer documents, CHL has shown Indian Hotels, EIH and Lemon Tree as its listed peers. They are currently trading at a P/Es of around 62, 83 and 172. (As on 25.01.19closing). However, they are not strictly comparable with CHL as its business model has diverse activities. Three merchant bankers associated with this offer have handled 45 public issues in the past three years out of which 12 public issued closed below the issue price on the day of listing. Currently hospitality sector is witnessing subdued sentiment. This company has shown loss for first half that raises concern. Considering these, risk savvy cash surplus investors may consider investment at their own risk. The Chalet Hotels Limited IPO Analysis helps you to understand about the company, offer detail, valuation, capital structure and financial performance. 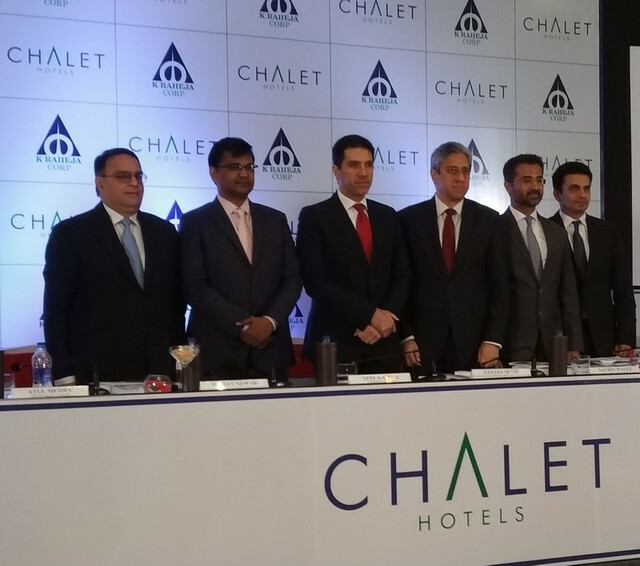 Our SEBI registered IPO Analysts tells you if Chalet Hotels Limited IPO worth investing. The Chalet Hotels Limited IPO Note sets the IPO expectations in systematic way which tells you if Chalet Hotels Limited IPO good to buy (good or bad / yes or no). The IPO Forecast tells you weather to invest in Chalet Hotels Limited IPO by providing IPO recommendations i.e. subscribe, avoid and neutral.